This HUGE house is like a lodge with 3800 square feet of living space. The house is perfect for large groups and the location is perfect! So much room to spread out and enjoy being together. We have just remodeled 3 of the bathrooms and redecorated all the bedrooms. We have an excellent cleaning service, so no need to worry. In addition to the 7 bedrooms there is a fully stocked kitchen with 3 ovens and 2 living areas so your group can divide up when desired. There are 2 TVs. 1 in each living room and feature Dish network channels. There is a wonderful huge fireplace in the main living room to enjoy after a day on the ski slopes or just to hang around with you are cold. The main house has five bedrooms, 3 upstairs & 2 downstairs, three baths, and sleeps 12. The attached rear unit has two more bedrooms and sleeps an additional six people. All rooms are nicely decorated and both kitchens have cookware and a dishwasher. Extra large hot tub in private yard. There are even 2 washers and dryers for your convenience. Most importantly, this house has passed the rigid inspection process required by the City of So Lake Tahoe and is approved as a vacation rental. Whoever wrote that nasty review must have stayed someplace else because this is a lovely home to rent. Although there are sometimes little mice which are common in mountain cabins. We have an excellent cleaning service. The house is located in a flat area accessible in most weather. There is parking in the driveway for 5 to 6 cars. The location is Great!!! Just a short walk to the lake, ten minutes to Heavenly Ski Resort or the Casinos. The area is wonderful for swimming, biking/hiking or just to stroll around the neighborhood. There is a boat launch and a bike path nearby. Have a great mountain experience in this wonderful cabin. Our rates vary during the year. We offer discounts for April, May, Sept, Oct, and Nov. For holiday rates please inquire. You will love this place!!! This is our current family. We are raising two of our grandchildren with the help of their dad. We have already raised 7 wonderful children and have 26 grandchildren who delight us regularly. We chose this property because we have a very large family and wanted a place we could all get together and have fun. There is always so much to do At Tahoe for people of all ages. With 7 bedrooms, a large group can relax in their own space or get together in our large great room. There are two living rooms which means the kids can sit and watch a movie out back, while the adults enjoy quiet conversation or a movie in the front. In the winter the fireplace gives warmth and comfort after a soak in the hottub. In the summer we live on the lake which is a short walk/drive away. Both summer and winter we often walk to the parks to sit and enjoy the lake. There are so many things to do in this area. Close to 3 ski resorts and several snow parks. Travel to Carson City for shopping, the Mint museum is great, train museum, more casinos and fine dining. There is even a ghost town a few miles away. Year round you can take a boatride over to Emeral Bay and tour Vikingsholm. The Heavenly tram goes up the mountain year round for skiing and hiking and just to see the view. During summer there are bike trails near the cabin, hiking trails all around the lake, a Shakespeare Festival, and many other activities. 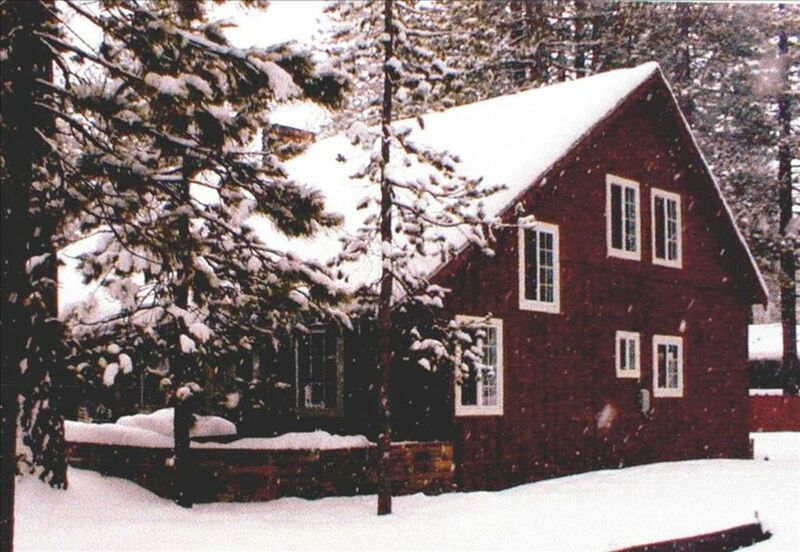 The Chamber of Commerce is located just across the Tahoe Blvd from the cabin. You will have a delightful time her at our newly remodeled cabin and while visiting this area.